Bluetooth For Printers | TonerGreen - Eco-Friendly Toners from the U.S.
Technology is rapidly growing at present that even the wired appliances before can now be used without those long cables. These items function through a Bluetooth device that sends signals to communicate with the other devices connected. If you would think of machines that can work with Bluetooth, maybe you’ll imagine of electronic devices like the parts of a computer. The keyboard and mouse can use this style of connection, so does the printer. A simple printer can be turned into a Bluetooth enabled one just by attaching a Bluetooth adapter. You wouldn’t have to worry about all the wires to be fixed because your printer is already wire-free when it uses this technology. Although this is hassle-free due to the lack of clutter made by wired things, how can you properly handle a Bluetooth enabled printer? Here are a few tips to remember while using this new kind of printer. Bluetooth is always dependent on the distance it has from the two connected devices. The most advisable length would be 30-330 feet depending on the hardware configuration. When the distance becomes farther, your battery will easily lose its power so make sure that you keep the printer and computer close to one another for better printing. Sometimes, when you have a great picture on your cell phone and you really need to print it, you can try to detect the Bluetooth system of your printer. When you have located it, just click print then you picture will be made quickly. 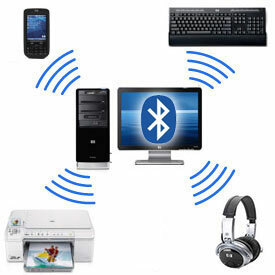 However, be careful when turning on your Bluetooth device because it can be susceptible to hacking. Just turn it off quickly after using. These ports are the main socket for a Bluetooth device. Make sure that the USB port you are using is in proper condition. If not, try using the other available USB ports on your computer for perfect connection. This is a very serious issue especially when personal files are stolen and worse a virus is sent to your computer. Avoid setting your Bluetooth device on “discoverable mode” when using it. This will prevent you from showing your IP address to others and your personal device will not be reached by hackers. For security purposes, always enable encryption on your Bluetooth enabled device. This is also applicable for your printer, of course. Connection and printing will always be possible if your system and software are always updated. Promptly do this to for good Bluetooth connection. Just follow these tips and your work with a Bluetooth enabled printer will be easier than you expected. Of course, for quality printing always use trusted makers of inks and toners.